Are you planning a kitchen or contemplating a new kitchen design? When it comes to kitchen planning and design, creating a good plan and being able to visualize your ideas is key. The kitchen is the hub of your home and it is often the room you spend the most time in. Therefore it’s important that your kitchen functions well and is a pleasant room to spend time in. So, if you find yourself lingering over kitchen design articles and creating pin boards with kitchen ideas, then you might be ready to plan your kitchen update… but where do you start? There is a lot of kitchen planning advice out there, but how do you know what will work in our own kitchen? One of the best new ways to figure that out is using an online kitchen planner. With an online kitchen planner, you can plan your kitchen, try out different kitchen design options and much more. 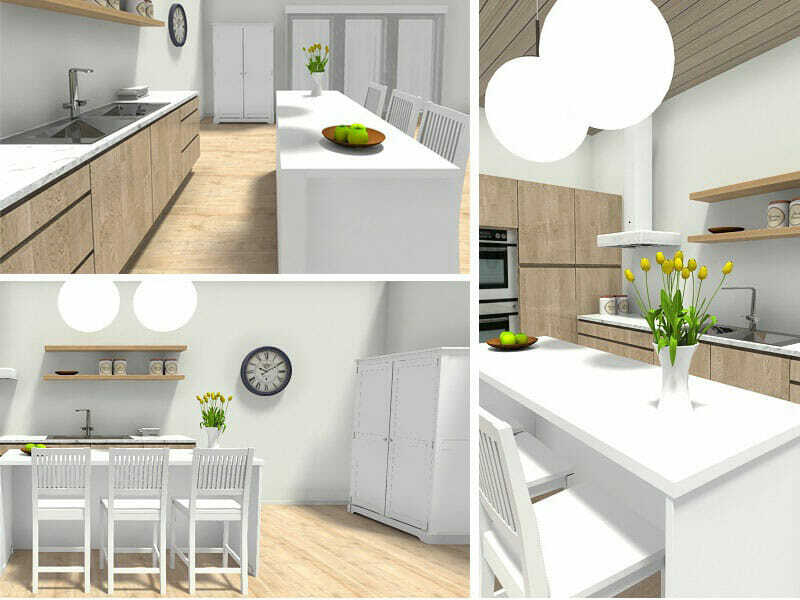 RoomSketcher provides an online floor plan and home design tool that can use create a kitchen design. Create floor plans, visualize different cabinet layouts, and find finishes and fixture options. With RoomSketcher, you can plan your kitchen right down to the color palette and the accessories. 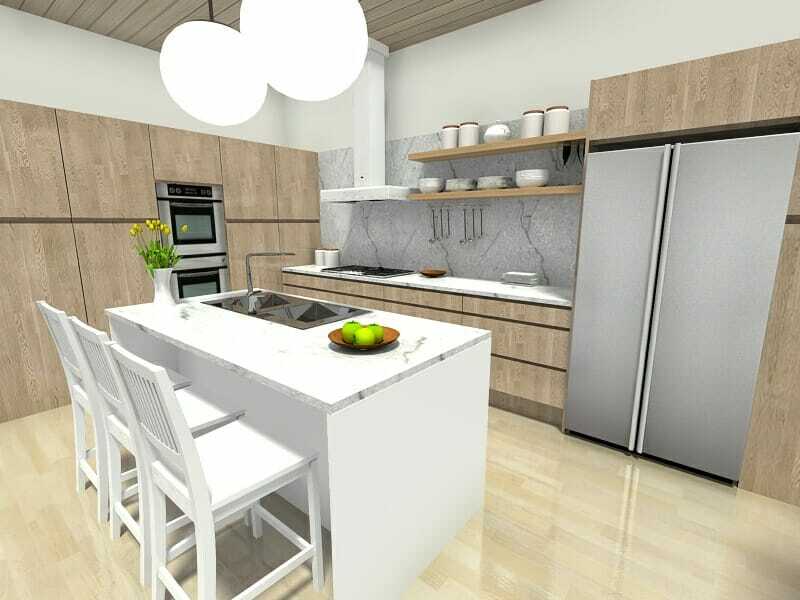 Unlike other kitchen planners, this online kitchen planner is easy-to-use, so you will be creating 2D & 3D kitchen floor plans and images of your kitchen design in no time. Kitchen Planning Tip: You may want to create two kitchen floor plans – one of your existing kitchen and one of your new kitchen design. Having both will help salespeople, suppliers and/or contractors to see more accurately what you need to create your kitchen design. This will save you both time and money when kitchen planning. And best of all, it’s easy to do using RoomSketcher – just create a new level to make a copy of your kitchen floor plan and start your new kitchen design. Kitchen Planning Tip: If you want to add a finish on only certain walls, such as behind the stove, you can paint a single wall. You can also find and match paint colors, as well as MDF, laminate and solid surface colors, such as Corian. Once your cabinets are in place, you can change the material or color on the kitchen cabinets and countertops using the Replace Materials feature. Try different options and compare as you go. 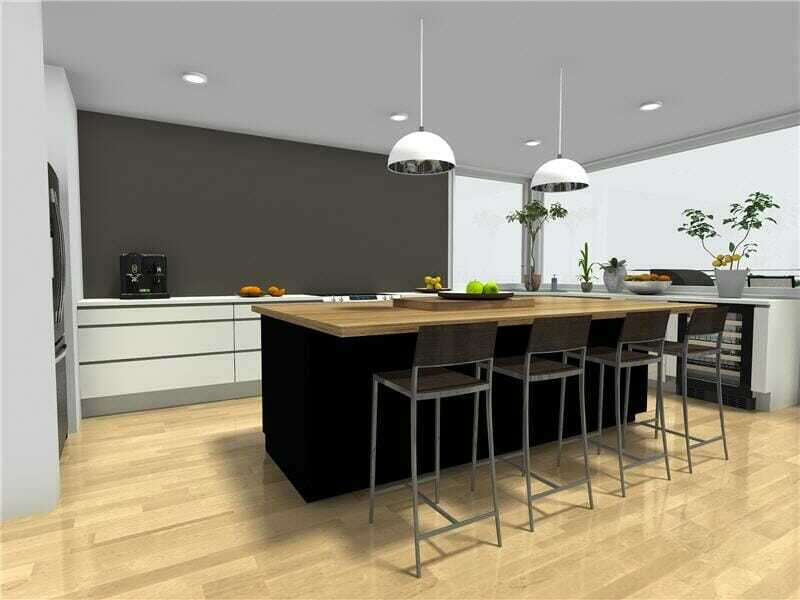 Now add appliances, furniture, and accessories to your kitchen floor plan. From cooktops and sinks to finishing touches like bowls of fruit, the RoomSketcher product library has over than 5.000 brand-name and generic products to choose from. Try different styles of dining tables, chairs, counter stools, shelving, sideboards and more to give your kitchen design a personal look. And don’t forget about lighting! 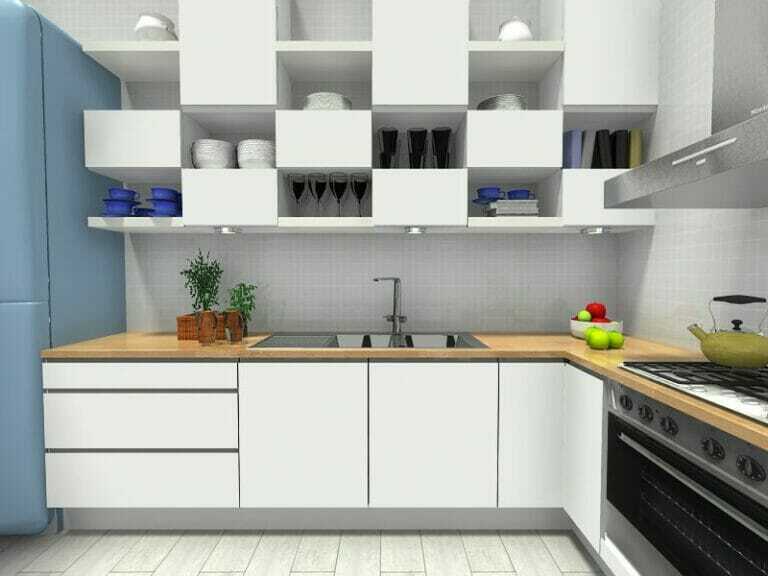 What’s cool about RoomSketcher, compared to other online kitchen planners, is that you can create amazing room images with it – like the ones in this article. 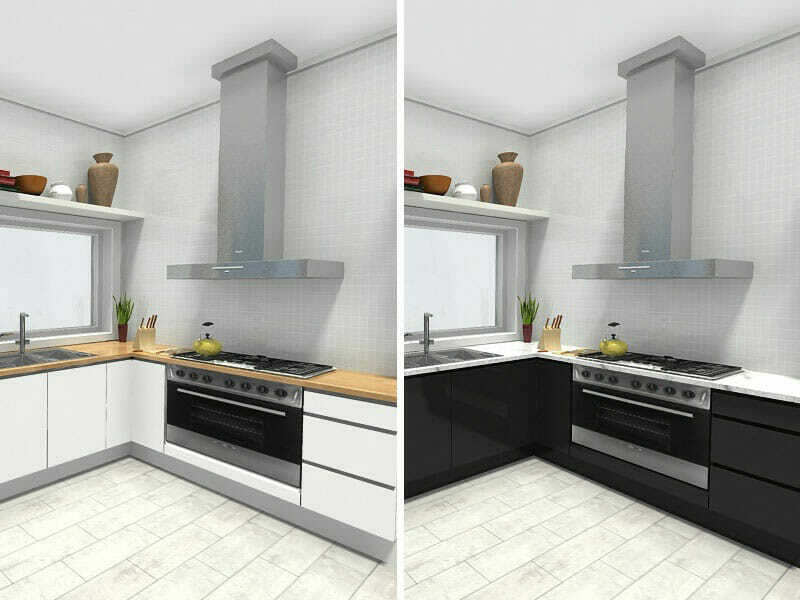 There is an integrated camera tool that you can use to take snapshots of your kitchen design and view any part of your kitchen as if you are actually standing there. This is so helpful when kitchen planning. You can adjust the camera height and aperture to get a wide-angle view of your kitchen or zoom in to see details close-ups. 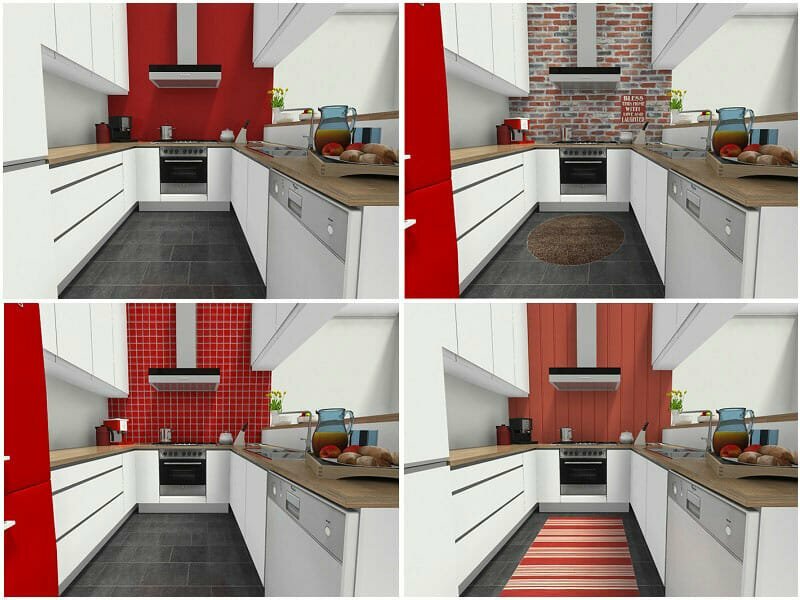 Snapshots make it easy to visualize your kitchen design ideas. Save your favorite Snapshots to the Image Gallery to compare different kitchen design options and find the ones that will work best for your kitchen. For more inspiration, check out these kitchen design ideas plus the RoomSketcher Home Design Gallery. With RoomSketcher, every user can access the RoomSketcher App and take snapshots for free, so you can start your kitchen planning straight away. Just draw your floor plan, furnish and decorate it, and see your design in 3D – it’s that easy! Frankie Elmquist is an interior architect and home design specialist. She’s worked around the globe for some of the top design firms in the world and now she brings her expertise to you.